A little more about our Antarctic departure. I did not think I would come to a point where leaving the South Pole would feel like leaving home - well a home away from home. But the time spent walking to work during our long winter, certain community events, spending more time with my wife on a daily basis than we ever have before, and other various factors made living at the end of the world quite appealing. When November finally came around, so did the time for us to leave the South Pole. This was an odd time for me. When Sarah first went to Antarctica I was unable to join her as I could not procure a job. The second time she left for the frozen continent and I was again incapable of finding a way for myself, and the place I had spent so much time reading about began to leave a bitter taste in my heart. She would come back, clearly changed and moved by her time in Antarctica, leaving a gap of sorts between us. This was a place that separated us. And yet it was a place she always longed to return to and was always sad to leave, which was difficult for me to say the least. So when we tried for a third attempt at an Antarctic adventure together, I was a little more than jaded and doubtful. Until the moment I climbed down out of a plane at the South Pole, I honestly thought any number of the countless different obstacles that could keep me from making my way would suddenly spring up out of nowhere. "Ha ha, nice try Brett. You got organs removed and did your best but you're not going to the South Pole you punk!" Stepping onto the glacial ice just outside of the Amundsen-Scott South Pole station was a surreal moment for me - not so much an achievement as a thing finally achieved. While Antarctica had become a small divisive force in our marriage up to the point of us both arriving at the Pole to winter-over, it did not take long for it to become one of the most unifying forces of our ten years being married. 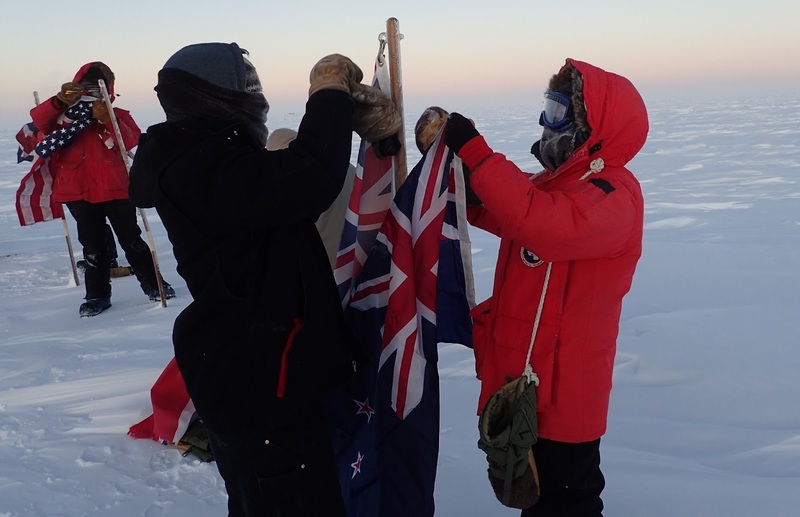 Sharing ten months together on the Antarctic plateau gave plenty of opportunity to live and grow as a married couple. Mostly, though, it was being able to spend so much time together that was so nice. The lack of normal distractions allowed us to more aptly experience and enjoy our time at the South Pole together. 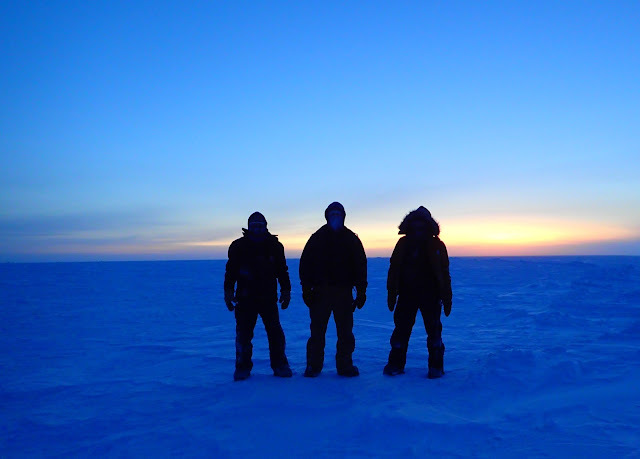 The planes started coming and our time at the Pole was coming to an end. We packed, shipped back some of our belongings, devoured the few pieces of fresh food that came in on the planes that transitioned through the Pole, said our goodbyes to everyone on station, and took as many last minute photos as we could - we literally drug one of our friends out to the ceremonial pole only minutes before our plane was supposed to leave. During this time of preparing to leave, a feeling of sorrow and sadness began to creep into my heart. As excited as I was to depart, I discovered what Sarah always tried to explain to me when she arrived back had begun making it's way into me as well. So I found myself feeling unexpectedly nostalgic the day we stood waiting for the LC-130 to land on an ice runway to take us home. While I felt the pull of family and friends we had not seen in so long, I also felt a feeling of loss seeded deep in my gut. 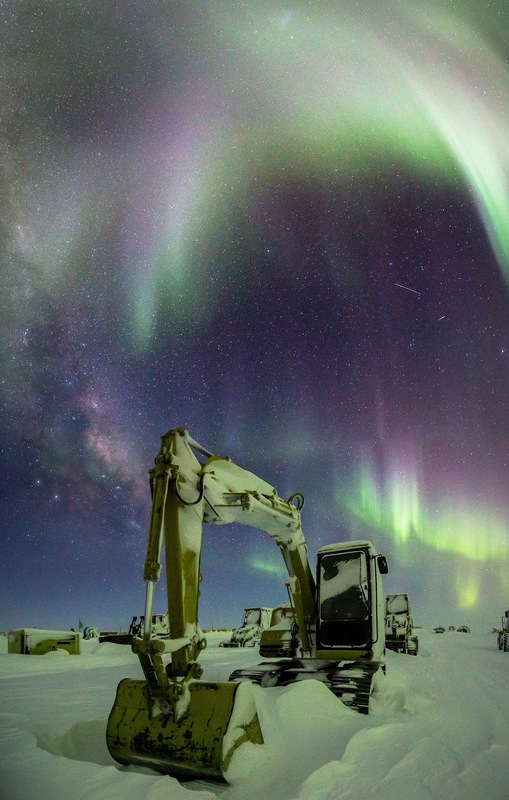 Though I was ready for some tasty food and copious amounts of sunshine, I knew I would soon find myself missing the oddities that make living at the South Pole memorable. And yet it was time to leave. We looked ahead to some time in New Zealand and some much needed family time. One wonderful part about leaving, that did not happen on the way down, was Sarah and I were fortunate enough to fly together. This made our departure, transitional time at McMurdo station, and our flights much more enjoyable. New Zealand!! I shared some in our last post about the time we were able to spend in New Zealand on the way back home. I wanted to add a few more photos of our time there - so much good food, amazing wines, relaxing moments together when we could just enjoy the New Zealand landscapes, and overall a time of rejuvenation. Last time I shared about our hike through Arthur's Pass, so this time I thought I might post a little bit about our time at Hanmer Springs and the New Zealand Air Force museum. While driving around this go around in New Zealand, we tried to visit as many places as we could we had missed during our year of living there. One of these such places was Hanmer Springs. This little town was not on the way to anywhere we went to on our previous adventures, and we had definitely missed out for having never been there. A cute little town, this haven of hot springs offers a way to enjoy the water from the springs in the form of a park. This enabled us to experience water from the springs in various pools of different temperatures and forms. Some of the pools were in their natural sulfuric state, while others had been chlorinated for a more clean way to soak in the healing waters. There were plenty of fun little shops in the town and a good sized hill nearby that offered lots of nice hikes. I ran a few of them and we hiked one of them together. We really enjoyed this out of the way nook of peace and tranquility. One of the last places we visited before leaving to fly home was the Air Force museum. We have a definite love of airplanes and always enjoy getting to spend time around them. This museum is a must for anyone who enjoys airplanes and/or museums. The Kiwis have always played a role in major wars, and learning of their dogfighting skills that came from flying in a country full of wild winds and cropdusting mountainous terrain was intriguing. We took a free behind-the-scenes tour of planes that were not quite yet ready for the main museum yet, learning even more about the process of how the planes are acquired and made ready for visitors. We both enjoyed our time at this museum and could have easily spent a few more hours enjoying ourselves learning about the history of planes in New Zealand. What a nice visit. One last New Zealand note - the seals! While we were hoping to swim with the seals, it was not quite the right time of year to jump in the water with the dogs of the sea. Even so, we spent some time in Kaikoura and made sure to visit an area where seals come ashore to sunbathe. It is not the same thing as swimming with them, but watching seals, or any marine wildlife in it's natural habitat, is one of our favorite pastimes. We always have to resist the urge to attempt taking one of them home as a pet. I am quite certain we might just come away with a few fingers less if we tried to act on these impulses, but we still think about it quite seriously. Thanksgiving!! This year we spent our Thanksgiving with the Williamson side of the family in a cabin not far outside of Asheville, North Carolina. What a way to enter back into our lives here in the United States! We enjoyed several beautiful hikes through the mountains, visited numerous waterfalls, caught up with our family, and played countless games late into the night. Some of the highlights from this week are Mount Mitchel (the highest peak east of the Mississippi), visiting Biltmore, and of course hanging out with Bubba - Gordon and Miriam's boxer. Mount Mitchell boasts hours of hiking on trails that are magnificently maintained. The summit offers a stellar panoramic view as far as the eye can see. Other mountains, small towns, countless trees in every direction - the mountain truly offers a commanding view of the area. We did two hikes that started on Mount Mitchell and enjoyed both of them immensely. If you ever find yourself anywhere near this mountain, go and hike as much of it as you can! Biltmore was almost as unbelievable as the view from Mount Mitchel but in a very different way. While the mountain offered a fantastic view of God's creation, the Biltmore house showed what human ingenuity (which I believe is placed in us by the Creator) can achieve with resources and creativity. It was easy to be impressed by the vision of George Vanderbilt while walking through the house he built for his family. A monumentally sized house, every aspect of life there was built around the concepts of art, beauty, history, and maximizing the aesthetic value of a home. Extravagant yes, but also magnificent. Apparently in all of the excitement of looking around at everything I neglected to take a single picture. Oh well. Bubba - well I'll just share this one last photo. This is a pic of us hanging out and snuggling. It probably says about all a picture needs to say about the nature of our relationship, and Bubba's personality. He's a big time lover dog. And as it turns out he's an avid hiker who likes climbing mountain trails maybe even more than I do. What a guy. Well thanks for dealing with my missing Antarctica so much I posted again about it, and a brief walk through of our journey back to the United States. Now it's time to celebrate Christmas Memphis style. By the way, Merry Christmas!! 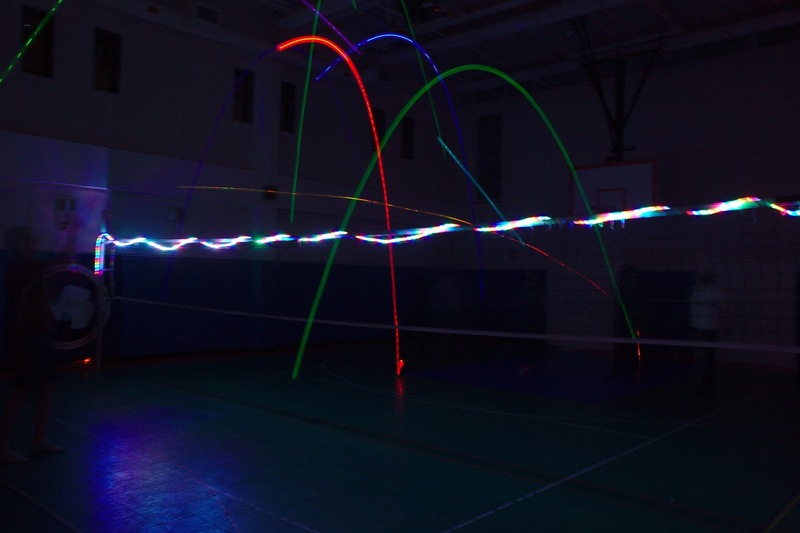 There is a fun tradition I think I have mentioned on the blog before. The South Pole was originally discovered and achieved (meaning they made it there) by two groups of men in the early 1900's. This meant that these men hiked/sledded/pulled/climbed the nearly 850 miles via their own power and some animal power (one team more than the other). At any rate, to encourage exercise while we are here during the winter at the South Pole, there is a "Back to McMurdo" challenge. A person keeps track of the mileage they have done on the treadmill/outside/on the rowing machine/on the bike/etc. There is a conversion chart for those who are not running or walking, so one can easily determine how many miles to add to the chart. The chart is a long banner hung in the workout room where anyone participating writes their name and their miles marked next to their name. This brings me to the horrible decision I made. In mid-August I made it to McMurdo. I felt a little bit of satisfaction and then I thought, the guys who did this originally came from McMurdo to the South Pole and then turned around to go back. Crap. I already knew what I was going to do and I was not happy about it. Did I have enough time to make it back to the South Pole, thus completing the entire journey? Only one way to find out. Thus began the last two months of two-a-days, and often three-a-days, just to make sure I could get enough mileage in to finish this silly goal. This past Saturday, with a tired body, I finally achieved enough miles to make it back to the South Pole. All my miles were done through running and rowing. The rowing gave my body enough rest to continue a ridiculous amounts of miles at times - there were times when I was hitting 22 to 26 miles a day. My secondary goal to this whole fiasco was to finish in time to get back to my normal routine before leaving the South Pole. It was a journey of almost 1700 miles. There were a lot of workouts when I definitely considered how entirely stupid the quest truly was. I guess at the end of the day the only rational thought I had was that if I needed to actually attempt to make my way back to McMurdo on foot I would be ready. This is unlikely as the planes are pretty good at getting here but you never know. The Amundsen-Scott South Pole Station sits upon two miles of glacial ice at the bottom of the world. It is one of the most remote places on this planet, over 800 miles from the next closest station. 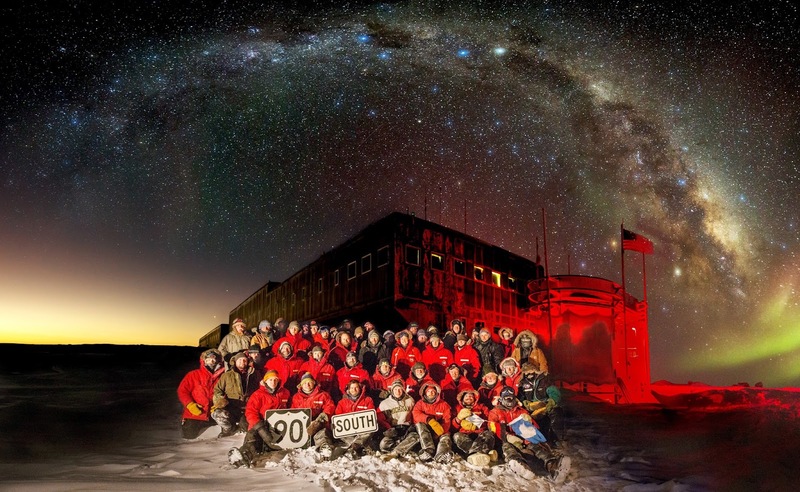 A group of people gather in this unusual location to help support science being done by the United States Antarctic Program. The United States has had a presence at the South Pole since 1956. More than a few support staff are needed for the scientists to complete their work and a small community forms. 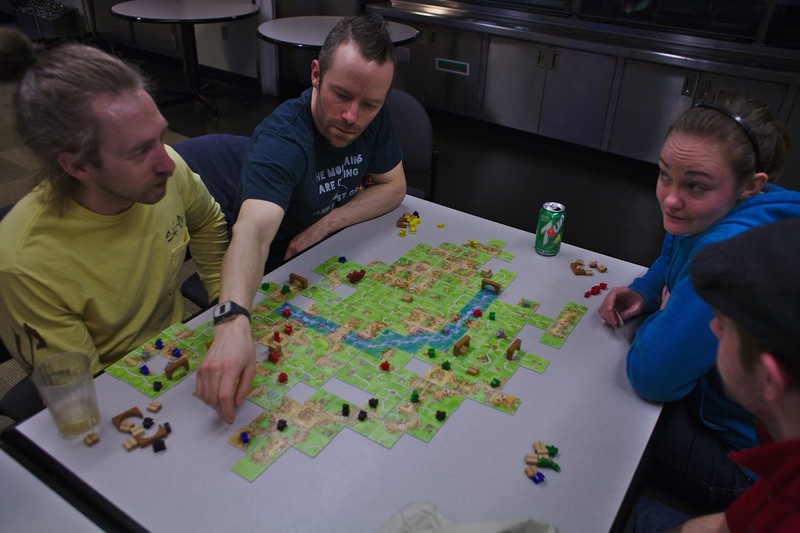 During the summer the population can soar to over 150 people, a teeming metropolis compared to the less than fifty who hunker down the long winter months. 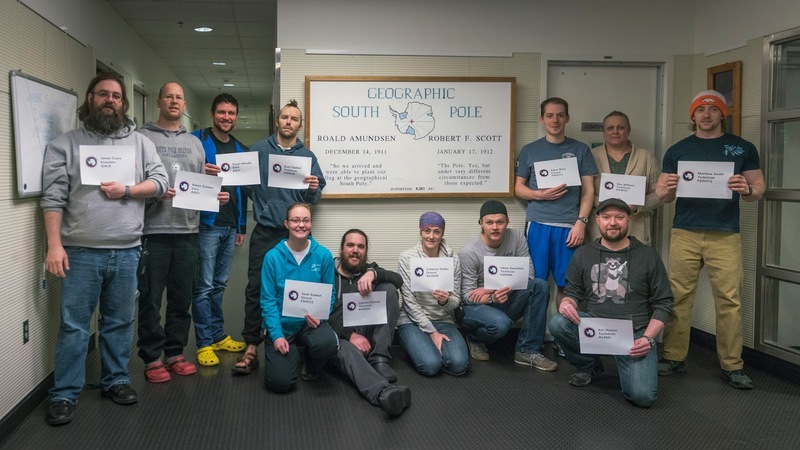 It is odd being one of forty-six people at the South Pole. Antarctica is not necessarily a place I saw myself ever visiting. Before we got married Sarah had at one point mentioned she wanted to go to Antarctica one day, but that is the sort of thing people say. Little did I know my wife is not most people. So I find myself living on a glacier and spending the entire ten-month Austral winter at the South Pole. Traveling and running is always difficult. Routine is broken. New places, while intriguing, sometimes offer odd dangers – getting lost, running into the wrong neighborhood, not knowing local laws. I’ve certainly found myself attempting to figure out the whole running deal while traveling for the past few years, and yet Antarctica has offered some fresh challenges for me. In route to the Pole I was waylaid for three weeks at McMurdo, a station on the coast that all planes fly through on their way to ninety degrees South. At this point it was the end of summer and the weather was really not too bad. I was able to get in a number of runs outside, enjoying some of the last sunshine I would run in for quite some time. I ran around Observation Hill and trails that lead past Robert Falcon Scott’s hut from when he and his team sought to earn the prize of the South Pole. 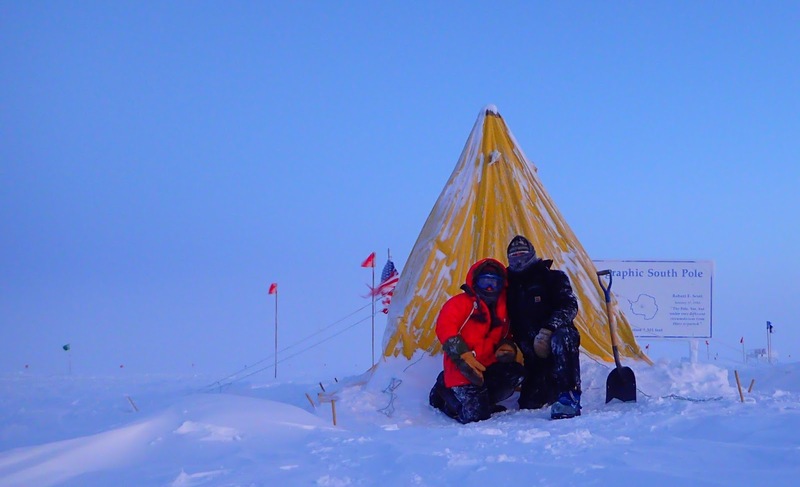 It was not until I left McMurdo and headed to the Pole that I encountered the most obvious and main two obstacles I would experience while in Antarctica - the extreme cold and being at altitude. The South Pole sits at 9,306 feet. The real issue is barometric pressure changes on a daily basis. Today we feel as though we are at 10,817 feet, though for the past two months we have spent most days over 11,000 feet. When combined with the dry air we breathe in here, Antarctica is technically a desert, the acclimation time for running took me quite some time. Then there is the cold. I grew up in Ohio before moving to Memphis my senior year of high school. I have run in cold temperatures while training for track during the winter months. Though this part of me became quite accustomed to Memphis winters, I had experienced bone chilling temperatures. Well, I thought I had. Arriving at the South Pole was a little bit of a rude awakening. I managed to get two runs in before the sun disappeared. Both were short and terrible. There is an almost constant wind ripping across the Antarctic plateau that our station sits on, and it is not forgiving. Negative fifty degrees with a strong wind is not pleasant. It was fine running with the wind but at some point one has to turn around. I have never felt wind cut through multiple layers of clothing (more than I had ever worn to run in my life) so easily. I froze. With the sun promising to disappear for four to five months and temperatures dropping I had only one valid option before me. It is an option I have avoided at all costs in the past. The treadmill. The treadmill has always been a tool I have loathed. Boring. Mundane. Unchanging. Pick the negative word and I have most likely associated it with the treadmill at some point in time. Yet there was this damned machine and it was my only option if I wanted to run. So a few months ago I hopped on the treadmill and began a strange journey. There were some immediate problems that arose. I had eliminated the problem of the extremely cold temperatures, but the altitude and dry climate still persisted in offering their resistance. The treadmill itself was everything I had expected of it. I made the decision early on to watch television shows or movies while running to keep my mind distracted, and maybe to keep my sanity intact. While keeping my mind occupied was not a replacement for running the trails at Shelby Farms, it did help stave off the sheer boredom of running in place for thirty minutes to an hour. The one aspect of treadmill running that has bothered me the most has been my inability to run the paces, according to the machine, I am accustomed to running. Until only recently, I have been at least one minute slower per mile and there is not much I have been able to do except for attempt to push a little harder to lower pace. Is it the altitude? The dry air? My hate for treadmills? A combination of everything? Or just some mental block to running on a machine? It has been months since my decision to take advantage of the treadmill. I have been slowly making my way through our extensive television series library. And, contrary to my expectations, I am beginning to like the treadmill. It could be like learning to enjoy the company of an unwelcome running partner simply because he is your only current option. But after he keeps showing up, run after run, as a faithful running buddy, a person can learn to like him. Running itself has always been this way with me. I ran hundreds of miles before I learned to love running. Even then the relationship was dicey at best, though usually running has been a joy. Learning to be content with my current running circumstances has not been easy, but the treadmill is becoming a close friend. The development of my new affinity for the treadmill, though welcome and surprising, has also opened the door to me making an absurd decision. I am going to run a marathon on the treadmill. Here is the issue. As any serious runner travels, she looks to the opportunities afforded to her in the running world. I have done the same with my time here in Antarctica. There are a few different chances to run a marathon on continent. Unfortunately none of them overlap the time during which I will be here. This was sad news to process. How perfect would it be to get in a marathon while on the continent? How many people have run one on all seven continents? With two continents under my belt it was sour grapes to see this opportunity slipping through my fingers. But did it have to be this way? I stared at the treadmill and considered. Could I even bring myself to make such a decision? The answer is apparently yes! As many of you might be thinking already, there are concerns with this marathon attempt. Does it really count if it is on a treadmill and not out in the elements? Surely anyone could run a marathon in a hotel in China and count the entire continent of Asia. I have my concerns on this issue, and yet should I allow these concerns to keep me from achieving what I might never have another chance to do in my lifetime? I made the decision to go ahead and begin my training, which meant also pushing all doubts and naysayers to the side – including myself. It is what it is and there is nothing to be done about it. So here I stand, with a goal I would deem absurd if anyone else mentioned it to me. This week I completed my longest run on a treadmill to date. Twenty miles came and went, along with multiple episodes of The Wire. Thanks to a homemade running gel (made of honey, water, salt, and molasses – I cannot just head down to the local running store) and being way more conscious about taking in plenty of water I felt much better than I thought I would. Previously anything above twelve miles has been quite a struggle. I have been mentally working past some of my previous issues with the pace on the treadmill, though I am still not working out at paces I am used to running the full marathon distance at in the past. In two weeks I will be attempting to run the full marathon. I am still debating on my pace goals. At this point I am fairly confident I will be able to finish this distance. My body has been responding decently to the twenty miler this week and I’m getting excited about seeing what will happen when I try to tack on another six miles. I never could have imagined running any of the distances I have completed on the treadmill, let alone a full marathon. I would say it is ridiculous but at this point it is just beginning to feel normal to me. It is as though the part of my brain that hated treadmills has been slightly worn away, as if a grinder has been slowly wearing it down. Running in Antarctica has been a challenge. I never would have thought the treadmill would be a friend in a time of need. I do look forward to the return of the sun and weather that will not sear my lungs, leaving me with a bloody cough for weeks. Even more so, I cannot wait until I fly through New Zealand and have the chance to go for a run in a much more accommodating climate. And yet I have this peculiar feeling that when I leave I might just miss my new companion. I will always be grateful to the machine I once despised, but between the two I will always choose a nice trail outside. Perhaps the South Pole can be my exception. For now the treadmill is a glorious machine enabling me to run, even while wintering-over in a place where the normal ambient temperature outside is around negative eighty degrees Fahrenheit – this does not include wind chill. The treadmill is my safe haven. Like many other tools in running the treadmill, however reluctantly I say even now, does have its place. Ok treadmill, let’s do this.